My books, The Women's Guide to Golf: A Handbook for Beginners, The Women's Guide to Consistent Golf and The Women's Guide to Lower Scores, represent the three stages of learning golf, specifically for women. Over the next months, I'll be highlighting some of the important information in those books in hopes of piquing beginners' interest for the game and more accomplished players' desire to improve. Let's start with the first book, especially for beginners. The initial stage of learning golf, with no experience or background, can be intimidating and overwhelming. The fear of embarrassing oneself can be enough to stop some people from starting. Unfortunately, common sense is not enough and it is pretty tough to fake golf. That is the goal of The Women's Guide to Golf: A Handbook for beginners: to give a true beginner golfer the initial information that is needed to 'fake it' 'til you make it. The book includes a thorough explanation of the game with easy-to-understand instructions as to how to get started and ways to remember what you have read. The instruction is designed to give women enough information to feel comfortable, but not too much information to feel overwhelmed. Do you know that the sand wedge is a confusing name for an 11 iron and not a club that can only be used in the sand? Do you know the difference between chipping and pitching? Do you know how far your 7 iron travels? Are you afraid to hit the ground (terraphobia)? And how do you correct this? How high should you tee the golf ball? Where should you stand while others are hitting? How are you going to survive your first round of golf with friends? By learning the answers to these questions and many others, the beginner golfer can feel comfortable in the new surroundings of the range and the golf course. The basic knowledge to get started can help develop confidence and make an intimidating place much more comfortable and fun. 1. Determine the instruction that suits you. Do you think you would like group instruction (clinics), or do you think you would do better with private lessons? What about a golf school? The price may be a determining factor here. Private lessons will be more expensive that clinics, but may help you to learn more quickly because of the individual attention. A golf school, and keep in mind there are many that are designed specifically toward women, can be a great way to be introduced to the game. But do you have the stamina to make it through the whole school? Another consideration, and one that I like, is to find a small group of friends, two to four, and share private lesson time. Having your friends with you can make it very enjoyable as is sharing the cost of the instructor. 2. Find the right instructor. Listen to the suggestions of others. It is virtually impossible to exist in today's world without speaking golf talk. Listen to others who already play and find out who they take lessons from and if they would recommend that instructor for you. I know it is a little scary to go to your first lesson or clinic because of the unknown. Will you even be able to hit the ball? Call, sign up and don't be afraid to ask questions, such as: When? How much? How many students will be attending? Who will be teaching? What will be covered? Do you need to have any prior knowledge to attend? Do you need to bring your own clubs or do they have some that you can borrow? 4. Dress appropriately and comfortably. Call ahead and determine the dress code at the facility where you will be taking your lessons. Be sure that your shorts are of proper length. Some facilities will require a collared shirt while others will not. This has become more lenient as golf facilities have become more aware of fashion. A good rule of thumb in my book is, if it does not have sleeves, it should have a collar and if it has sleeves a collar is not necessary. Some facilities will require golf shoes and others sneakers are just fine. You will also probably want to bring a golf glove to help to protect your hands. If you are right handed, you will wear the glove on your left hand. 5. Once you find an instructor you trust, listen intently. Your instructor will be a wonderful source of information on learning the game of golf. This should include the proper grip and set up as well as the swinging motion. Time should also be spent on the short game. You should be able to understand him or her. Bring a notebook with you to each lesson and take notes. You may find that the fundamentals you need to improve will be the same over time and by writing them down in once place you can save the time of forgetting and having to be constantly reminded. 7. Make your investment in your clubs when you determine that you like the game and want to continue. Don't rush to purchase clubs, and avoid starter sets. Save the money you would use for a starter set and use it for the right set for you once you've been bitten by the golf bug. Your instructor will be a great source of information of what brands of clubs you should try as well as the set make up. 8. Are you ready to go out on your own? Are you ready to practice on your own? Are you ready to go onto the course? Ask your instructor. You may also want to schedule a lesson on the course to help to make the transition from the range to the course. You will also need to know some etiquette. The front of the rulebook for golf has a list of etiquette. 9. Enjoy the good shots. Learn to enjoy your good ones. If you can understand up front that you will not be perfect or as consistent as you probably would like and you can make peace with this you will appreciate your successes. Kellie's books can be found at Barnes & Noble and on Amazon.com. - Kellie Stenzel, PGA, has been named by Golf Magazine as one of the Top 100 Teachers in America, and has been a Golf For Women Top 50 teacher since 1999. She has published three books: "The Women's Guide to Golf: A Handbook for Beginners," "The Women's Guide to Consistent Golf," and "The Women's Guide to Lower Scores." 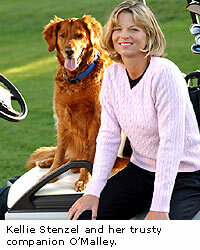 She is also rated by Golf Digest as one of the top teachers in New York.